Is Winning Everything – Part 6 – Bria! “If you want to be competitive, you need to get a different breed.” (See note at the end of post!) That’s what I was told. “A Sheltie if you want a small dog or a Border Collie if you want a bigger dog” Well I decided on a BC. I started sending out some feelers and looking for a new puppy. I was’t working really hard on it, but when the time was right, I was sure a puppy would end up in my lap. And that was exactly what happened! I was in Florida for the 2007 AKC Nationals with Noodle and I stayed around for the fabulous Miami Obedience Club trial. Sitting around at lunch one day, we were talking about puppies and someone said. “If I were looking for a puppy right now, I would contact so and so” Well an email was sent and pictures were received. I saw those pictures and was instantly in love! The next thing I knew a smooth, lilac BC was on her way to Miami, Florida. I went to the airport to meet my little girl – so sweet! The flight attendant came down to make sure she was claimed and told me that it was really cold in Washington DC so she took her out of cargo and put her in the 1st class closet and gave her water bottles to play with! Yes, my princess flew 1st class! Soon we were on our way back to Minnesota. I had been gone almost a month and the last thing I was planning was to come home with a puppy let alone a PURPLE PUPPY. She learned lots of good tricks on the way home. Tug was good a game, so when mom isn’t around, create my own tug game! Sagehill’s All that and More – “Con Bria” meaning With Spirit. Spirit is what she had. I had grown up with spaniels, boy did I have a lot to learn now having a BC! Bria was a thinker. She liked games, she loved to train and if I didn’t give her a game, she would create her own game. Something she still does today. She liked to be right and she loved to play clicker games. When I taught my violin lessons, she was in her crate in my room. I heard something from upstairs and I “thought” she was chewing her bone. Nope, she had poked her little nose through the crate and was eating my wall! Well, her crate was now sitting in the middle of the room and she couldn’t reach anything. I learned quickly about manipulating the environment! Puzzles, Puzzles, Puzzles – If I wanted to keep this puppy out of trouble, I was going to have to mentally tire her out! 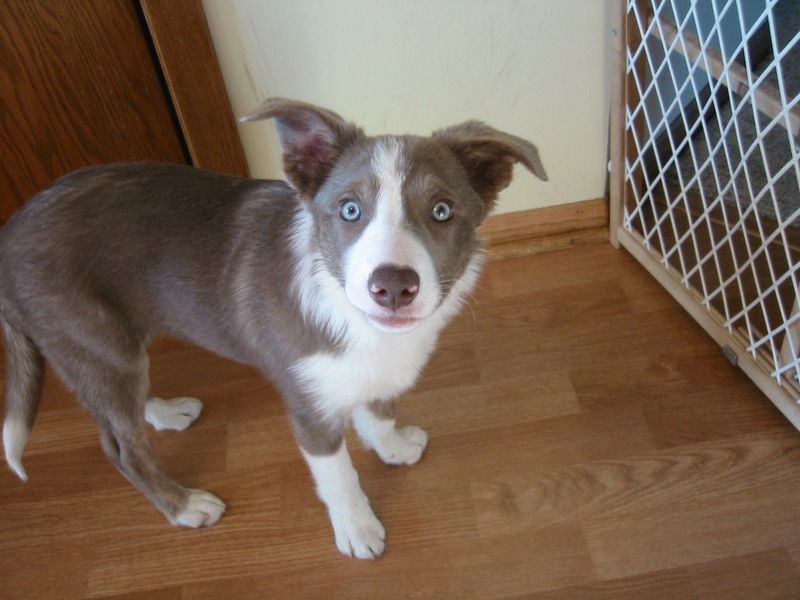 I had my Border Collie…now I could “Win Something”!